De robuuste draadloze Motorola MC3190 is thuis in de winkel en magazijngangen, op het laadperron en buiten in de tuin. Gebruikmakend van Motorola's nieuwe mobiliteitsplatform, biedt de MC3190 geavanceerde rekenkracht, toonaangevende capaciteiten voor gegevensvastlegging en superieure ergonomie. Naast de verwerkingskracht en het geheugen die nodig zijn om geavanceerde toepassingen te ondersteunen, biedt de MC3190 ook de nieuwste mobiele technologie en beveiliging. Een geïntegreerde RFID-tag automatiseert het volgen van assets, waardoor ondernemingen MC3190-apparaten rechtstreeks kunnen volgen en lokaliseren. Een geïntegreerde accelerometer maakt geavanceerde motion-gebaseerde applicaties mogelijk die het energiebeheer verbeteren en meer. Robuuste beveiligingsfuncties beschermen gevoelige gegevens. Dankzij de compatibiliteit met het bestaande MC3000-accessoiresecosysteem kunnen organisaties upgraden naar de nieuwste technologie, terwijl de bestaande accessoire-investering behouden blijft. Het resultaat is een robuust, betaalbaar apparaat dat retailers, overheidsinstellingen en distributiecentra helpt bij het stroomlijnen en foutbestendige bedrijfsprocessen, waardoor de productiviteit van medewerkers verbetert, evenals klantenservice en tevredenheid. MC3190-GL4H04E0A Wi-Fi (802.11a/b/g), Gun-Grip, 1D Laser Scanner, 48 key Alphanumeric Keypad, High Capacity Battery, Bluetooth, Full Audio, 1D Laser Scanner, Color Touch Display, Windows CE 6.0 Pro, 256MB RAM/1GB ROM, English. Interface cables and charging cradle sold separately. For the full kit see (Part# MC3190-GL4H04E0A-KIT). MC3190-RL3S04E0A Rotating Head, 1D Laser Scanner, 38 key Shifted Alpha Keypad, Wi-Fi/Bluetooth, Full Audio, Color Touch Display, Windows CE 6.0 Pro, 256MB RAM/1GB ROM, English. Cables and Charging Cradle Not Included. For the full kit see (Part# MC3190-RL3S04E0A-KIT). MC3190-GI4H24E0A Wi-Fi (802.11a/b/g), Gun-Grip, 2D Imager Scanner, 48 key Alphanumeric Keypad, High Capacity Battery, Bluetooth, Full Audio, Color Touch Display, Windows Mobile 6.5 Classic, 256MB RAM/1GB ROM, English. Interface cables and charging cradle sold separately. For the full kit see (Part# MC3190-GI4H24E0A-KIT). MC3190-SI3H04E0A Wi-Fi (802.11a/b/g), Brick Straight Shooter, 2D Imager, Windows CE 6.0, 256MB RAM/1GB ROM, 38 key AlphaShift Keypad, High Capacity Battery, Bluetooth, Full Audio, Color Touch Display, English. Interface cables and charging cradle sold separately. For the full kit see (Part# MC3190-SI3H04E0A-KIT). MC3190-RL2S04E0A-KIT Starter Kit Bundle That Includes the PDT – Wi-Fi (802.11a/b/g), Rotating head, 1D Laser Scanner, Windows CE 6.0, 256MB RAM/1GB ROM, 28 key Numeric Keypad, Bluetooth, Full Audio, Color Touch Display, English. Kit includes USB cable, cradle, power supply, and US line cord. MC3190-GL3H04EIA Gun Grip, 1D Laser Scanner, High Capacity Battery, Interactive Sensor Technology, Wi-Fi/Bluetooth, Full Audio, Color Touch Display, Windows CE 6.0 Pro, 256MB RAM/1GB ROM, English. Cables and charging cradle not included. MC3190-SL2H04E0A Brick Straight Shooter, 1D Laser Scanner, 28 key Numeric Keypad, High Capacity Battery, Full Audio, Color Touch Display, Windows CE 6.0 Pro, 256MB RAM/1GB ROM, English. Cables and Charging Cradle Not Included. For the full kit see (Part# MC3190-SL2H04E0A-KIT). MC3190-RL3S24EIA-KIT Complete Kit: Includes cradle, USB cable, power supply, US line cord, and MC3190-R (Rotating Head, 1D Laser Scanner, 38 key Numeric Keypad, Interactive Sensor Technology, Standard Capacity Battery, Wi-Fi/Bluetooth, Full Audio, Color Touch Display, Windows Mobile 6.5 Classic, 256MB RAM/1GB ROM, English). MC3190-GI2H24E0A Gun-Grip, 2D Imager, 28 key Numeric Keypad, High Capacity Battery, Wi-Fi/Bluetooth, Full Audio, Color Touch Display, Windows Mobile 6.5 Classic, 256MB RAM/1GB ROM, English. Cables and Charging Cradle Not Included. MC3190-SL3H24E0A Brick Straight Shooter, 1D Laser Scanner, 38 key Alpha Shift Keypad, High Capacity Battery, Wi-Fi/Bluetooth, Full Audio, Color Touch Display, Windows Mobile 6.5 Classic, 256MB RAM/1GB ROM, English. Cables and Charging Cradle Not Included. For the full kit see (Part# MC3190-SL3H24E0A-KIT). MC3190-SI3H24E0A-KIT Complete Kit: Includes cradle, USB cable, power supply, US line cord, and MC3190-S (Brick Straight Shooter, 2D Imager, 38 key Alpha Shift Keypad, High Capacity Battery, Wi-Fi/Bluetooth, Full Audio, Color Touch Display, Windows Mobile 6.5 Classic, 256MB RAM/1GB ROM, English). MC3190-RL2S24E0A Rotating Head, 1D Laser Scanner, 28 key Numeric Keypad, Standard Capacity Battery, Wi-Fi/Bluetooth, Full Audio, Color Touch Display, Windows Mobile 6.5 Classic, 256MB RAM/1GB ROM, English. Cables and Charging Cradle Not Included. For the full kit see (Part# MC3190-RL2S24E0A-KIT). MC3190-GI3H24E0A Gun Grip, 2D Imager, 38 key Alpha Shift Keypad, High Capacity Battery, Wi-Fi/Bluetooth, Full Audio, Color Touch Display, Windows Mobile 6.5 Classic, 256MB RAM/1GB ROM, English. Cables and charging cradle not included. MC3190-RL4S04E0A Wi-Fi (802.11a/b/g), Rotating head, 1D Laser Scanner, 48 key Alphanumeric Keypad, Bluetooth, Full Audio, Color Touch Display, Windows CE 6.0 Pro, 256MB RAM/1GB ROM, English. Interface cables and charging cradle sold separately. For the full kit see (Part# MC3190-RL4S04E0A-KIT). MC3190-GL2H24E0A Gun Grip, 1D Laser Scanner, 28 key Numeric Keypad, High Capacity Battery, Wi-Fi/Bluetooth, Full Audio, Color Touch Display, Windows Mobile 6.5 Classic, 256MB RAM/1GB ROM, English. Cables and Charging Cradle Not Included. MC3190-SL4H04E0A-KIT Starter Kit Bundle That Includes the PDT – Wi-Fi (802.11a/b/g), Brick Straight Shooter, 1D Laser Scanner, Windows CE 6.0, 256MB RAM/1GB ROM, 48 key Alphanumeric Keypad, High Capacity Battery, Bluetooth, Full Audio, Color Touch Display, English Version. Kit includes USB cable, cradle, power supply, and US line cord. MC3190-SL4H04E0A Brick Straight Shooter, 1D Laser Scanner, 48 key Alphanumeric Keypad, High Capacity Battery, Wi-Fi/Bluetooth, Full Audio, Color Touch Display, Windows CE 6.0 Pro, 256MB RAM/1GB ROM, English. Cables and Charging Cradle Not Included. For the full kit see (Part# MC3190-SL4H04E0A-KIT). MC3190-SI4H04E0A-KIT Complete Kit: Includes cradle, USB cable, power supply, US line cord, MC3190-S (Brick Straight Shooter, 2D Imager, 48 key Alphanumeric Keypad, High Capacity Battery, Wi-Fi/Bluetooth, Full Audio, Color Touch Display, Windows CE 6.0 Pro, 256MB RAM/1GB ROM, English). MC3190-SI4S02E0U Wireless Mobile Computer, WLAN 802.11a/b/g, 2D Imager, Color Touch Screen, 48 key, 128/512MB, Windows Ce 6.0, Standard Capacity 2740 mAh Battery, Bluetooth. MC3190-GI4H04EAA Wi-Fi (802.11a/b/g), Gun-Grip, Bluetooth, 2D Imager, Windows CE 6.0 Pro, 256MB/1GB ROM, 48 key, High Capacity Battery. Interface cables and charging cradle sold separately. MC3190-RL4S24E0A Wi-Fi (802.11a/b/g), Rotating head, 1D Laser Scanner, Windows Mobile 6.5 Classic, 256MB RAM/1GB ROM, 48 key Alphanumeric Keypad, Bluetooth, Full Audio, Color Touch Display, English. Interface cables and charging cradle sold separately. For the full kit see (Part# MC3190-RL4S24E0A-KIT). MC3190-GL4H04E0A-KIT Starter Kit Bundle That Includes the PDT – Wi-Fi (802.11a/b/g), Gun-Grip, 1D Laser Scanner, 48 key Alphanumeric Keypad, High Capacity Battery, Bluetooth, Full Audio, 1D Laser Scanner, Color Touch Display, Windows CE 6.0 Pro, 256MB RAM/1GB ROM, English. Kit includes USB cable, cradle, power supply, and US line cord. MC3190-SI4H04E0A Wi-Fi (802.11a/b/g), Brick Straight Shooter, 2D Imager, Windows CE 6.0, 256MB RAM/1GB ROM, 38 key AlphaShift Keypad, High Capacity Battery, Bluetooth, Full Audio, Color Touch Display, English. Interface cables and charging cradle sold separately. For the full kit see (Part# MC3190-SI4H04E0A-KIT). MC3190-RL3S04E0A-KIT Complete Kit: Includes cradle, USB cable, power supply, US line cord and MC3190-R (Rotating Head, 1D Laser Scanner, 38 key Shifted Alpha Keypad, Wi-Fi/Bluetooth, Full Audio, Color Touch Display, Windows CE 6.0 Pro, 256MB RAM/1GB ROM, English). MC3190-SL2S04E0A Brick Straight Shooter, 1D Laser Scanner, 28 key Numeric Keypad, Standard Capacity Battery, Wi-Fi/Bluetooth, Full Audio, Color Touch Display, Windows CE 6.0 Pro, 256MBRAM/1GB ROM, English. Cables and charging cradle not included. MC3190-RL4S24E0A-KIT Complete Kit: Includes cradle, USB cable, power supply, US line cord, and MC3190-R (Rotating Head, 1D Laser Scanner, 48 key Alphanumeric Keypad, Standard Capacity Battery, Wi-Fi/Bluetooth, Full Audio, Color Touch Display, Windows Mobile 6.5 Classic, 256MBRAM/1GB ROM, English). MC3190-GL4H24E0A Wi-Fi (802.11a/b/g), Gun Grip, 1D Laser Scanner, 48 key Alphanumeric Keypad, High Capacity Battery, Bluetooth, Full Audio, Color Touch Display, Windows Mobile 6.5 Classic, 256MB RAM/1GB ROM, English. Interface cables and charging cradle sold separately. For the full kit see (Part# MC3190-GL4H24E0A-KIT). MC3190-RL3S24E0A Wi-Fi (802.11a/b/g), Rotating head, 1D Laser Scanner, Windows Mobile 6.5 Classic, 256MB RAM/1GB ROM, 38 key Alpha Shift Keypad, Bluetooth, Full Audio, Color Touch Display, English. Interface cables and charging cradle sold separately. For the full kit see (Part# MC3190-RL3S24E0A-KIT). MC3190-GI4H04EIA-KIT Complete Kit: Includes cradle, USB cable, power supply, US line cord, and MC3190-G (Gun-Grip, 2D Imager, 48 key Alphanumeric Keypad, High Capacity Battery, Interactive Sensor Technology, Wi-Fi/Bluetooth, Full Audio, Color Touch Display, Windows CE 6.0 Pro, 256MBRAM/1GB ROM, English). MC3190-GD3H24EIA Gun Grip, 2D DPM Imager, 38 key Alphanumeric Keypad, High Capacity Battery, Interactive Sensor Technology, Wi-Fi/Bluetooth, Full Audio, Color Touch Display, Windows Mobile 6.5 Classic, 256MB RAM/1GB ROM, English. Cables and charging cradle not included. MC3190-SL3H04E0A-KIT Complete Kit: Includes cradle, USB cable, power supply, US line cord, and MC3190-S (Brick Straight Shooter, 1D Laser Scanner, 38 key Alpha Shift Keypad, High Capacity Battery, Wi-Fi/Bluetooth, Full Audio, Color Touch Display, Windows CE 6.0 Pro, 256MB RAM/1GB ROM, English). MC3190-SL4H24E0A Wi-Fi (802.11a/b/g), Brick Straight Shooter, 1D Laser Scanner, 48 key Alphanumeric Keypad, High Capacity Battery, Bluetooth, Full Audio, Color Touch Display, Windows Mobile 6.5 Classic, 256MB RAM/1GB ROM, English. Cables and Charging Cradle Not Included. For the full kit see (Part# MC3190-SL4H24E0A-KIT). MC3190-GL4H24E0A-KIT Starter Kit Bundle – Includes The PDT – Wi-Fi (802.11a/b/g), Gun Grip, 1D Laser Scanner, 48 key Alphanumeric Keypad, High Capacity Battery, Bluetooth, Full Audio, Color Touch Display, Windows Mobile 6.5 Classic, 256MB RAM/1GB ROM, English. Kit includes USB cable, cradle, power supply, and US line cord. MC3190-GL3H04E0A Wi-Fi (802.11a/b/g), 1D Laser Scanner, Windows CE 6.0 Pro, Gun-Grip, 256MB RAM/1GB ROM, 38 key Numeric Keypad, High Capacity Battery, Bluetooth, Full Audio, Color Touch Display, English. Interface cables and charging cradle sold separately. For the full kit see (Part# MC3190-GL3H04E0A-KIT). MC3190-SI4S04E0A Brick Straight Shooter, 2D Imager, 48 key Alphanumeric Keypad, Standard Capacity Battery, Wi-Fi/Bluetooth, Full Audio, Color Touch Display, Windows CE 6.0 Pro, 256MB RAM/1GB ROM, English. Cable and charging cradle not included. MC3190-RL3S24E0A-KIT Complete Kit: Includes cradle, USB cable, power supply, US line cord, MC3190-R (Rotating Head, 1D Laser Scanner, 38 key Alpha Shift Keypad, Standard Capacity Battery, Wi-Fi/Bluetooth, Full Audio, Windows Mobile 6.5 Classic, 256MB RAM/1GB ROM, English). MC3190-GL3H24EIA Gun Grip, 1D Laser Scanner, 38 key Alpha Shift Keypad, High Capacity Battery, Interactive Sensor Technology, Wi-Fi/Bluetooth, Full Audio, Color Touch Display, Windows Mobile 6.5 Classic, 256MB RAM/1GB ROM, English. Cables and charging cradle not included. MC3190-SL3H04E0A Wi-Fi (802.11a/b/g), Brick Straight Shooter, 1D Laser Scanner, Windows CE 6.0, 38 key Alpha Shift Keypad, High Capacity Battery, Bluetooth, Full Audio, Color Touch Display, 256MB RAM/1GB ROM, English. Interface cables and charging cradle sold separately. For the full kit see (Part# MC3190-SL3H04E0A-KIT). MC3190-SI3H04E0A-KIT Complete Kit: Includes cradle, USB cable, power supply, US line cord, and MC3190-S (Brick Straight Shooter, 2D Imager, 38 key Alpha Shift Keypad, High Capacity Battery, Wi-Fi/Bluetooth, Full Audio, Windows CE 6.0 Pro, 256MB RAM/1GB ROM, English). MC3190-RL2S04E0A Wi-Fi (802.11a/b/g), Rotating Head, 1D Laser Scanner, 28 key Numeric Keypad, Bluetooth, Full Audio, Color Touch Display, Windows CE 6.0 Pro, 256MG RAM/1GB Rom, English. Cables and Charging Cradle Not Included. For the full kit see (Part# MC3190-RL2S04E0A-KIT). MC3190-GL2H04EIA Gun Grip, 1D Laser Scanner, 28 key Numeric Keypad, High Capacity Battery, Interactive Sensor Technology, Wi-Fi/Bluetooth, Full Audio, Color Touch Display, Windows CE 6.0 Pro, 256MB RAM/1GB ROM, English. Cables and charging cradle not included. MC3190-GL4H04EAA Gun-Grip, Wi-Fi (802.11a/b/g), Bluetooth, Laser Scanner, Windows CE 6.0 Pro, 256MB/1GB ROM, 48 key, High Capacity Battery. Cables and Charging Cradle Not Included. MC3190-SL3S04E0A Brick Straight Shooter, 1D Laser Scanner, 38 key Alpha Shift Keypad, Standard Capacity Battery, Wi-Fi/Bluetooth, Full Audio, Color Touch Display, Windows CE 6.0 Pro, 256MBRAM/1GB ROM, English. Cables and charging cradles not included. MC3190-RL3H04EIA Rotating Head, 1D Laser Scanner, 38 key Alpha Shift Keypad, High Capacity Battery, Interactive Sensor Technology, Wi-Fi/Bluetooth, Full Audio, Color Touch Display, Windows CE 6.0 Pro, 256MB RAM/1GB ROM, English. Cables and charging cradles not included. MC3190-GI4H04E0A Wi-Fi (802.11a/b/g), Gun-Grip, 2D Imager, 48 key Alphanumeric Keypad, High Capacity Battery, Bluetooth, Full Audio, Color Touch Display, Windows CE 6.0 Pro, 256MB RAM/1GB ROM, English. Interface cables and charging cradle sold separately. For the full kit see (Part# MC3190-GI4H04E0A-KIT). MC3190-GL2H24EIA Gun Grip, 1D Laser Scanner, 28 key Numeric Keypad, High Capacity Battery, Interactive Sensor Technology, Wi-Fi/Bluetooth, Full Audio, Color Touch Display, Windows Mobile 6.5 Classic, 256MB RAM/1GB ROM, English. Cables and charging cradle not included. MC3190-SL4H24E0A-KIT Starter Kit Bundle That Includes the PDT – Wi-Fi (802.11a/b/g), Brick Straight Shooter, 1D Laser Scanner, 48 key Alphanumeric Keypad, High Capacity Battery, Bluetooth, Full Audio, Color Touch Display, Windows Mobile 6.5 Classic, 256MB RAM/1GB ROM, English Version. Kit includes USB cable, cradle, power supply, and US line cord. MC3190-SI3H24E0A Brick Straight Shooter, 2D Imager, 38 key Alpha Shift Keypad, High Capacity Battery, Wi-Fi/Bluetooth, Full Audio, Color Touch Display, Windows Mobile 6.5 Classic, 256MB RAM/1GB ROM, English. Cables and Charging Cradle Not Included. For the full kit see (Part# MC3190-SI3H24E0A-KIT). MC3190-RL2S24E0A-KIT Complete Kit: Includes cradle, USB cable, power supply, US line cord, and MC3190-R (Rotating Head, 1D Laser Scanner, 28 key Numeric Keypad, Standard Capacity Battery, Wi-Fi/Bluetooth, Full Audio, Color Touch Display, Windows Mobile 6.5 Classic, 256MB RAM/1GB ROM, English). MC3190-SL2H24E0A Brick Straight Shooter, 1D Laser Scanner, 28 key Numeric Keypad, High Capacity Battery, Wi-Fi/Bluetooth, Full Audio, Color Touch Display, Windows Mobile 6.5 Classic, 256MBRAM/1GB ROM, English. Cables and Charging Cradle Not Included. 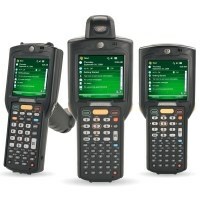 MC3190-RL4S04E0A-KIT Starter Kit Bundle That Includes the PDT – Wi-Fi (802.11a/b/g), Rotating head, 1D Laser Scanner, 48 key Alphanumeric Keypad, Bluetooth, Full Audio, Color Touch Display, Windows CE 6.0 Pro, 256MB RAM/1GB ROM, English. Kit includes USB cable, cradle, power supply, and US line cord. MC3190-SI2H24E0A Brick Straight Shooter, 2D Imager, 28 key Numeric Keypad, High Capacity Battery, Wi-Fi/Bluetooth, Full Audio, Color Touch Display, Windows Mobile 6.5 Classic, 256MB RAM/1GB ROM, English. Cables and charging cradle not included. MC3190-RL3S04EIA Rotating Head, 1D Laser Scanner, 38 key Numeric Keypad, Standard Capacity Battery, Interactive Sensor Technology, Wi-Fi/Bluetooth, Full Audio, Color Touch Display, Windows CE 6.0 Pro, 256MB RAM/1GB ROM, English. Cables and Charging Cradle Not Included. For the full kit see (Part# MC3190-RL3S04EIA-KIT). MC3190-GI4H04E0A-KIT Starter Kit Bundle That Includes the PDT – Wi-Fi (802.11a/b/g), Gun-Grip, 2D Imager, 48 key Alphanumeric Keypad, High Capacity Battery, Bluetooth, Full Audio, Color Touch Display, Windows CE 6.0 Pro, 256MB RAM/1GB ROM, English. Kit includes USB cable, cradle, power supply, and US line cord. MC3190-GD3H04EIA Gun Grip, 2D DPM Imager, 38 key Alpha Shift Keypad, High Capacity Battery, Interactive Sensor Technology, Wi-Fi/Bluetooth, Full Audio, Color Touch Display, Windows CE 6.0 Pro, 256MB RAM/1GB ROM, English. Cables and charging cradle not included. MC3190-SL2H04E0A-KIT Complete Kit: Includes cradle, USB cable, power supply, US line cord, and MC3190-S (Brick Straight Shooter, 1D Laser Scanner, 28 key Numeric Keypad, High Capacity Battery, Full Audio, Color Touch Display, Windows CE 6.0 Pro, 256MB RAM/1GB ROM, English). MC3190-GI4H04EIA Gun-Grip, 2D Imager, 48 key Alphanumeric Keypad, High Capacity Battery, Interactive Sensor Technology, Wi-Fi/Bluetooth, Full Audio, Color Touch Display, Windows CE 6.0 Pro, 256MB RAM/1GB ROM, English. Cables and Charging Cradle Not Included. For the full kit see (Part# MC3190-GI4H04EIA-KIT). MC3190-SI2H04E0A Brick Straight Shooter, 2D Imager, 28 key Numeric Keypad, High Capacity Battery, Wi-Fi/Bluetooth, Full Audio, Color Touch Display, Windows CE 6.0 Pro, 256MB RAM/1GB ROM, English. Cables and Charging Cradle Not Included. For the full kit see (Part# MC3190-SI2H04E0A-KIT). MC3190-SI4H24E0A Wi-Fi (802.11a/b/g), Brick Straight Shooter, 2D Imager, 48 key Alphanumeric Keypad, High Capacity Battery, Bluetooth, Full Audio, Color Touch Display, Windows Mobile 6.5 Classic, 256MB RAM/1GB ROM, English. Interface cables and charging cradle sold separately. For the full kit see (Part# MC3190-SI4H24E0A-KIT). MC3190-RL3S04EIA-KIT Complete Kit: Includes cradle, USB cable, power supply, US line cord, and MC3190-R (Rotating Head, 1D Laser Scanner, 38 key Numeric Keypad, Standard Capacity Battery, Interactive Sensor Technology, Wi-Fi/Bluetooth, Full Audio, Color Touch Display, Windows CE 6.0 Pro, 256MB RAM/1GB ROM, English). MC3190-GL3H24E0A Gun-Grip, 1D Laser Scanner, 38 key Alpha Shift Keypad, High Capacity Battery, Wi-Fi/Bluetooth, Full Audio, Color Touch Display, Windows Mobile 6.5 Classic, 256MB RAM/1GB ROM, English. Cables and Charging Cradle Not Included. For the complete kit see (Part# MC3190-GL3H24E0A-KIT). MC3190-GI2H04E0A Gun-Grip, 2D Imager, 28 key Numeric Keypad, High Capacity Battery, Wi-Fi/Bluetooth, Full Audio, Color Touch Display, Windows CE 6.0 Pro, 256MB RAM/1GB ROM, English. Cables and Charging Cradle Not Included. MC3190-RL2H04E0A Rotating Head, 1D Laser Scanner, 28 key Numeric Keypad, High Capacity Battery, Wi-Fi/Bluetooth, Full Audio, Color Touch Display, Windows CE 6.0 Pro, 256MB RAM/1GB ROM, English. Cables and charging cradle not included. MC3190-SI3H24EIA Brick Straight Shooter, 2D Imager, 38 key Alpha Shift Keypad, High Capacity Battery, Interactive Sensor Technology, Wi-Fi/Bluetooth, Full Audio, Color Touch Display, Windows Mobile 6.5 Classic, 256MB RAM/1GB ROM, English. Cables and charging cradle not included. MC3190-GI3H04E0A Gun Grip, 2D Imager, 38 key Alpha Shift Keypad, High Capacity Battery, Wi-Fi/Bluetooth, Full Audio, Color Touch Display, Windows CE 6.0 Pro, 256MB RAM/1GB ROM, English. Cables and charging cradle not included. MC3190-RL3S24EIA Rotating Head, 1D Laser Scanner, 38 key Numeric Keypad, Interactive Sensor Technology, Standard Capacity Battery, Wi-Fi/Bluetooth, Full Audio, Color Touch Display, Windows Mobile 6.5 Classic, 256MB RAM/1GB ROM, English. Cables and Charging Cradle Not Included. For the full kit see (Part# MC3190-RL3S24EIA-KIT). MC3190-GI4H24E0A-KIT Starter Kit Bundle That Includes the PDT – Wi-Fi (802.11a/b/g), Gun-Grip, 2D Imager Scanner, 48 key Alphanumeric Keypad, High Capacity Battery, Bluetooth, Full Audio, Color Touch Display, Windows Mobile 6.5 Classic, 256MB RAM/1GB ROM, English. Kit includes USB cable, cradle, power supply, and US line cord. MC3190-GL2H04E0A Wi-Fi (802.11a/b/g), 1D Laser Scanner, Windows CE 6.0 Pro, Gun-Grip, 256MB RAM/1GB ROM, 28 key Numeric Keypad, High Capacity Battery, Bluetooth, Full Audio, Color Touch Display, English. Interface cables and charging cradle sold separately. For the full kit see (Part# MC3190-GL2H04E0A-KIT).